Once in awhile, I come across a product so cool, it would just be a tragedy not to use it. Such is the case with the brand-new H20+ Aquafirm Weekly Active Foam Mask. This mask has a gel-like consistency that, upon rubbing into the skin, turns into an amazing white foam right before your eyes! Within about 15 seconds of sitting upon the skin, the gel begins to foam and froth, leaving in its wake a concoction of white bubbles that tingle delightfully. And as if that's not cool enough, the product actually works. One use and you'll already see softer, smoother skin left in its wake, thanks to marine microspheres (to plump the skin), sea nutrient barrier (a fusion of algae and oat extract for a micro-lifting effect) and brown sea kelp (rich in amino acids that support skin elasticity and collagen levels). I recommend using once a week. You only need to leave the mask on the skin for about 5 minutes for it to work, which means you can even do it in the morning while you're getting dressed or doing your hair for work! 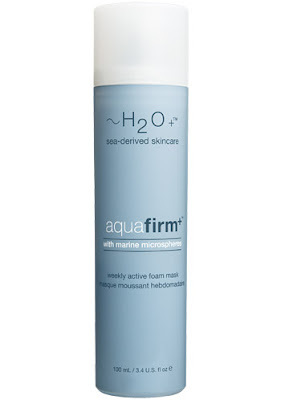 The H20+ Aquafirm Weekly Active Foam Mask retails for $32 at h20plus.com.